I remember in 1995 driving down Flamingo looking at the dome go up on the famous Bellagio thinking “WOW!!! Vegas is now complete”. Then came the $1 Billion Venetian down the street which opend in 1999 and became my favorite hang out in the late 90’s because of the great lounge music and awesome indoor walking at the canals. (still one of my favorite goto places to walk during the summer to escape the heat). The last MEGA development to hit the Las Vegas strip and be completed was the $8 Billion dollar “City Center” which started in 2006 and includes the Crystals Shopping mall, ARIA hotel and casino, Mandarin Oriental & the distinct Veer Towers, which are in final selling phase of its new high rise condos. Next time your driving down the strip check out VEER TOWERS as it sits dead center of action and is a very unique offering of Las Vegas strip condos for sale. 3 1/2 Years + 3 1/2 Developments = $10 Billion Dollars. First let’s clear up the 3 1/2 and round it to 4 developments until I’m proven wrong and these are the 4 in which I not only feel are important to know, but in order of which I think will actually happen and why. Let me just disclose upfront that even those I put Steve Wynn’s plan at the end of the list – he is my Las Vegas Hero. If you don’t know who this guy is, good or bad, his story is amazing and books about him are legendary. Personally I have met him 3 times and have to say he is personable, runs the best operations in the game and I miss that he has not been in Las Vegas more as he may be the last of the great Casino owners who understood people & gave the people what they wanted. Next to Elvis, Frank Sinatra and a few others – Steve Wynn is the guy who really made VEGAS. Let’s jump back to the top of the playlist and talk about Conventions, the Las Vegas SUPER BOWL & Dragons. Yes, there are going to be Dragons. $130 Million may not sound like much money compared to $10 Billion, but its what this expansion represents. Las Vegas is currently rated #1 in the USA for convention destinations and despite the mass amounts of current space available Las Vegas demands more. The number of convention delegates visiting Las Vegas has risen 41 percent since 2010 to top 6 million last year. The expansion will be an extra 250,000 square feet, bringing this destination to a total of 850,000 square feet. To create a mental picture that would be like combining 4 large Costcos and then adding 2 more to those. I have been to a few meetings here and have to say its well done with great parking and easy to navigate. You can see more pics here as well as contact them if you are thinking of doing your next convention in Las Vegas. Keep in Mind that MGM properties already include Mandalay Bay which did a $70 Million expansion in 2014 and added 350,000 square feet to that location. In 2016, MGM did a $150 million expansion of Aria’s convention center, adding 200,000 square feet. 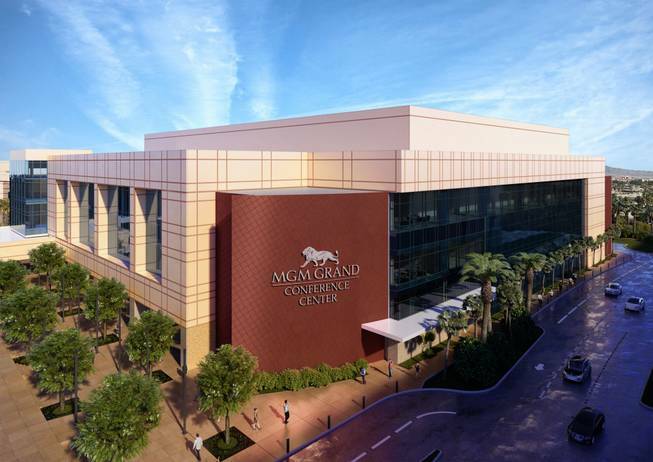 In total, MGM will control over 4 Million square feet of convention and meeting space in Las Vegas. 2nd would be The Venetian and Palazzo at 2.3 million square feet of meeting and convention space. It goes with out question that if you are looking to host a convention, MGM may have room and rooms as the MGM is also largest resort hotel in the USA. It is also one of the few places you can also buy a Hotel Condo and actually own your own room. For more on that check out MGM Signature condos for sale. Sports fans are divided on this until maybe they see the cost difference between flying to Vegas and Oakland and also the cost of hotel rooms. Simply put, it is like half price to go see anything in Las Vegas as say something in say California or NY. One of the reasons Las Vegas holds the majority of UFC fights and major Boxing matching is because it can handle huge amounts of fans, and its designed to do it very well with plenty of rooms and accommodations. The Raiders have completed the purchase of a 62-acre site for their future stadium in Las Vegas, Nevada. The site, located just to the west of the Mandalay Bay resort, cost $77.5 million to acquire. 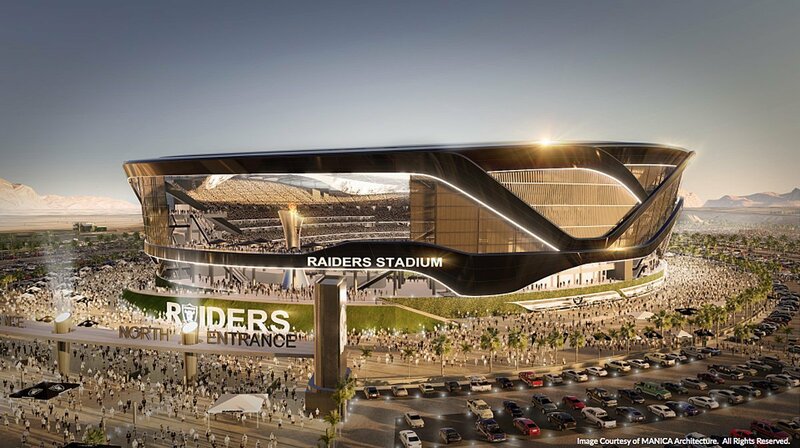 The Raiders will continue to play at in Oakland stadium through the 2019 season and are expected to move into their new stadium in Las Vegas for the 2020 NFL season. But for those of us here in Vegas we have already started to embrace the logo and team. We are ready! 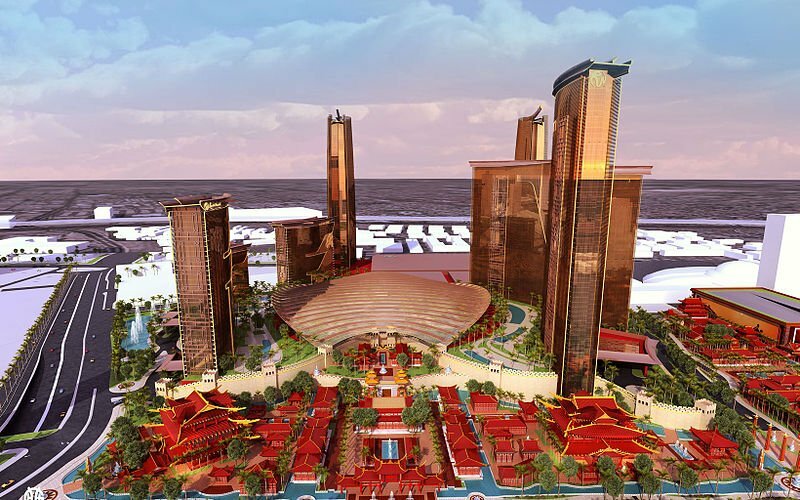 With $1+ Billion dollars left for development that means something amazing, and if you want to know what $1 Billion looks like in development just see the massive and beautiful Venetian hotel casino which cost $1 Billion. This Massive 65,000-seat stadium will be located adjacent to Interstate-15 and will be connected to the city’s expanding monorail system once it is built out to Mandalay Bay in the coming years. The monorail will not only make it easy for Visitors to simply arrive at the stadium from the southern strip hotels. Las Vegas residents who own some of the Las Vegas high rise condos such as VEER, Mandarin, Panorama, Martin or MGM Signature condos already have the monorail outside their door. If it sounds like I’m pitching an investment for Las Vegas strip condos for sale, I am, and you may what to consider doing so before KICK OFF. $4-10 Billion dollars, give or take a billion is the projected spend on this project. I have given up on trying to get exact figures on this as the project has changes several times over the years. However, the cranes are going up in the sky as this is written and construction has begun. I think Wikipedia has it at $7 Billion which is down the middle. Regardless, this may be the largest and most massive resort casino to be constructed in Las Vegas history. The completed 21,847,314-square-foot (2,029,681.9 m2) project will include 4 towers totaling 6,583 rooms with 175,000-square-foot (16,300 m2) casino. That’s a total of like 14 or 15 Mega Costcos all stuck together. This will include a 4,000-seat theater, Retail, dining and convention space. The Extras which can change during the development include Rooftop sky park and observation deck, Aquarium, Ice skating rink, Indoor water park and a Panda exhibit. The location is were the Stardust you to be at and the long running Wayne Newton show. The Genting Group purchased the land from MGM for $350 million in March 2013. If you want a better idea of whats going on behind the fences just take a tour of the TRUMP Las Vegas condos for sale as this development is a neighboring property. Good or Bad, TRUMP did something amazing when he acquired and built the only tower that will sit between The WYNN, Fashion Show Mall and now RESORTS WORLD. You can see more about TRUMP Las Vegas condos for sale here. 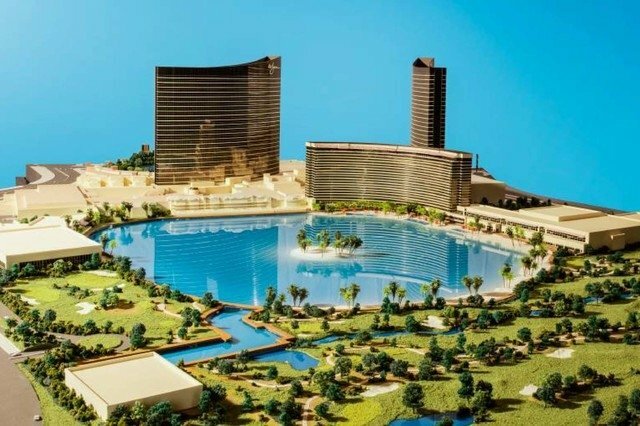 Wynn Resorts is considering $1.5 Billion investment to include a 1,000-room expansion at its Strip property centered around a 38-acre lagoon that would host water skiing, paddle boarding and parasailing by day and fireworks displays at night. This amazing dream is suppose to be completed by 2020 at the same time as the Raiders stadium and Resorts World. Personally I don’t see it working out and I’ll tell you why. 1st let me just say I am not an expert on Resorts or Casinos, but I am not only an industry leader in real estate – I walk the street the Las Vegas. Not only that – I have been walking the the streets of Las Vegas since I was a kid and have an idea why some things work and some don’t. Now before I bash on this project let me remind you that Steve is my Las Vegas HERO and he made the best properties so far. 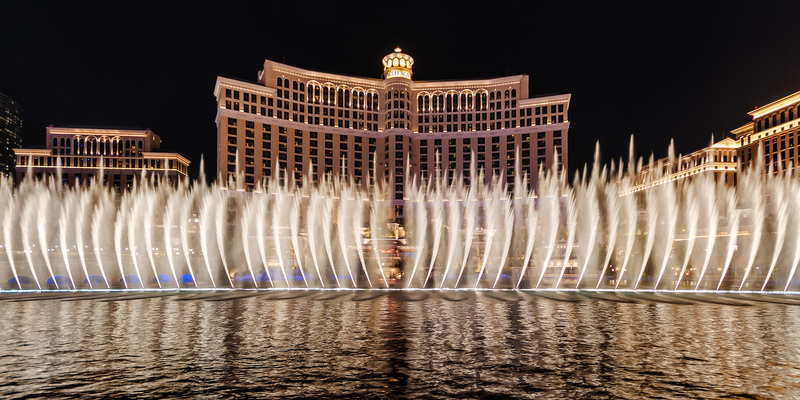 I personally was on the list opening night at the Bellagio and had a hotel key ring delivered to my house – It was Awesome. Steve was there and greeted everyone and can I just say again it was Awesome. This is when Vegas was Vegas and the people in the town still felt that connection with the Strip. I wonder how my life would have turned out had I not had the magic of seeing Pirates of the Caribbean, Witnessed the creation and magic of a Volcano with water in the desert and missed the not be able to walk by the Bellagio fountains. They are all inspiring and make dreamers – dream & dreams come true. The WYNN and ENCORE sit on the strip and there is there no room on the front end for pedestrian traffic. Not only that, everything there is EXPENSIVE and you don’t walk in the door with out some cash and credit cards. It is one of the most amazing places in Las Vegas that the locals can not really enjoy and the kids or teens can ever look at and dream about going. Stick a park in the back the only guest can enjoy and you have just an expensive place with overhead. Mandalay Bay has their beach parties ect. and has found ways to entice locals. But even that is almost a bit out of price range for most to enjoy. Now with over 20 years of real estate experience and a lifetime of walking the Las Vegas streets – I have some great ideas for this space. Yes, includes alot of FREE space were anyone can enjoy the path like the new park space between NYNY and VEER Towers. Yes, it includes a new FREE show like the Volcano and Bellagio that goes off every 30 minutes on each end. (Think about when you use to run from one end of Ceasers palace to the other to catch the automated fountain shows in the forum shopping). But these ideas are for another time and place and project. Until the year 2020 lets focus on the here and now and take advantage of what Las Vegas has to offer us today. The biggest benefactors to these developments are the surrounding Las Vegas strip condos for sale. There are currently no more high rises being built and what you see is what you get. The Las Vegas night line is dramatic and is recognized world wide. Those who are able to secure a view unit of the Las Vegas Strip will reap the benefits as this units become in more demand. A few tips on buying units would be to not buy to high as people have a fear of heights and to always by the unit with a view of the strip. These units tend to have the best turnout time on the market. Until next time – stay cool as its 110 degrees today. Go walk the canal shops at the Venetian and may I recommend lunch at the LUXE cafe at the end. Makes for a super nice day.